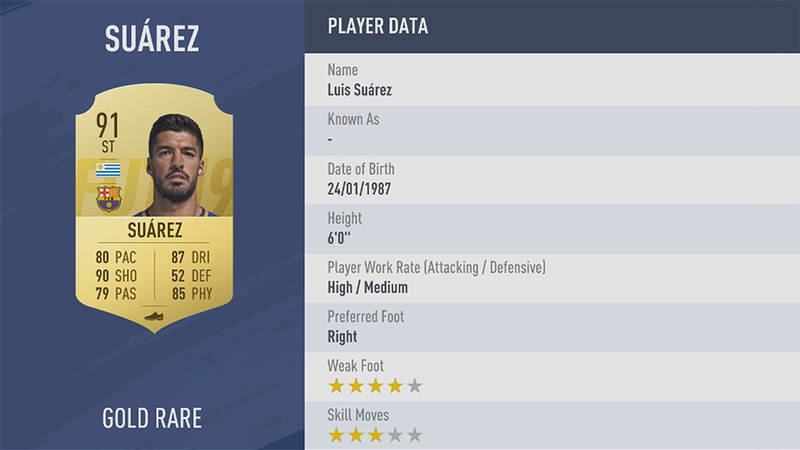 FIFA 19 ratings showcase the top players in the game based on their performances from the past year of world football. 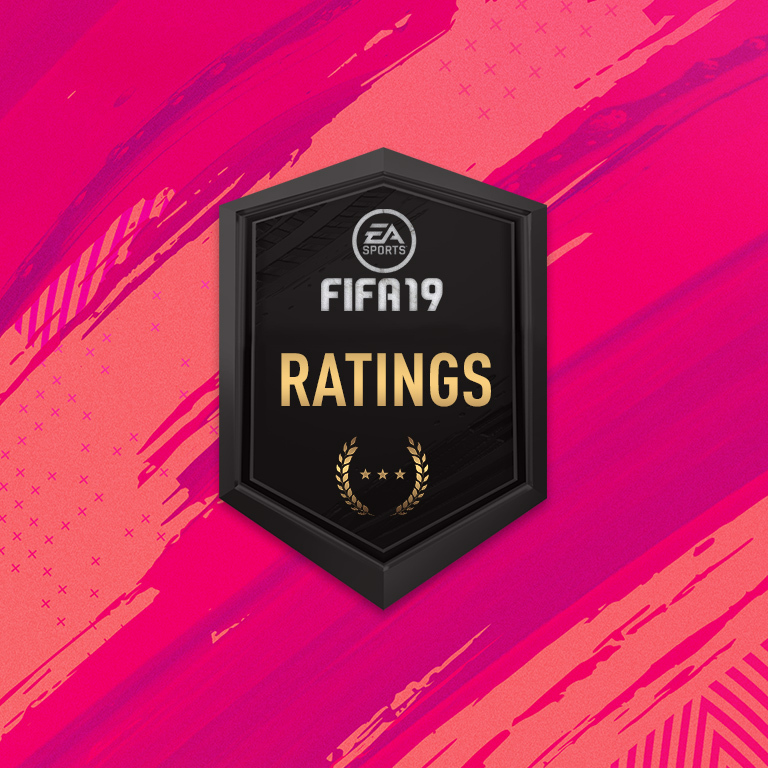 These are the top 100 highest-rated players in FIFA 19 and FIFA 19 Ultimate Team™. Use the hashtag #FIFARatings on Twitter, Facebook, and Instagram to join in the conversation. The engine that keeps the dominant Real Madrid machine running, Kroos is multiple ideal midfielders all rolled into one brilliant player. He can fire the ball with pinpoint accuracy anywhere on the pitch with his 89 Passing rating and create space for himself and teammates with his 82 Dribbling rating. Though he’s usually played central and deep, his technique on the ball and 82 Shooting rating make him nearly as dangerous when he finds himself closer to the box. The world’s highest-rated goalkeeper has the best nerves in the business; his 94 Reflexes and 90 Diving ratings mean that it will take more than a decent shot to catch him off-guard. Years of experience at the highest level have also honed the Spaniard’s superb 88 Positioning, and he has become one of the finest at distributing the ball with his foot, thanks to an 87 Kicking rating. The incisive central striker in Barcelona’s system, Suarez constantly frustrates opponents with his elusiveness on the ball (87 Dribbling) and his strength (85 Physical), which keeps defenders at arm’s length. But the Uruguayan’s finishing is also among the highest in the game (90 Shooting), and the sight of Suarez with the ball is enough to haunt even the most experienced defenders’ nightmares. Currently the top-rated defender in world football, Ramos spent his early career as a right-back. But it was when he transitioned to center back that the Spaniard cemented his place in the sport’s upper echelon. Ramos has a commanding 91 Defending rating, which manifests in his exceptional leadership, perfect tackling, and aerial expertise. Another well-rounded player whose abilities make him dangerous in any attacking role, Hazard is a winger by name—but he’s likely to wreak havoc on opponents wherever he happens to pop up on the pitch. The Belgian always manages to find space that didn’t exist before, using his speedy 91 Pace and classy 94 Dribbling ratings to open up any game for himself and his teammates. Yet another exceptional Belgian making his mark at the highest level, De Bruyne runs the show for Manchester City and played a huge part in the reigning champions’ title run. His 92 Passing is his greatest asset as a playmaker, but De Bruyne is also wildly elusive on the ball with his 87 Dribbling, so he’s always finding himself with options. And whether taking a direct free kick or taking a shot from open play, De Bruyne is an elite finisher who boasts an 86 Shooting rating. The reigning World Cup Golden Ball winner has been highly regarded for a long time now, but his recent successes have catapulted him into superstardom. The Croatian playmaker can do just about anything from midfield, because his 90 Passing and 91 Dribbling ratings are among the best in the game. Few players can change a match in an instant with a perfect pass or a long-range rocket shot like Modric can. The samba master has made an even bigger name for himself since moving to Paris Saint-Germain, where his signature Brazilian flair is on display every week. Neymar Jr. is effective in any attacking role, thanks to his stellar ratings in nearly every major category, but his 92 Pace and 95 Dribbling are what make him the paramount left winger in the world. Still going strong after years of breaking records and winning trophies, the Argentine attacker is undoubtedly one of the greatest to ever play the game. Messi’s talents and skills make him extremely versatile; 96 Dribbling shows why his technique is the best in the world, and his 88 Passing rating gives him a playmaking ability that few others even come close to. Combine that with the 91 Shooting rating and it’s easy to understand why Messi has broken nearly every possible goalscoring record. It all adds up to the recipe for a true football legend. 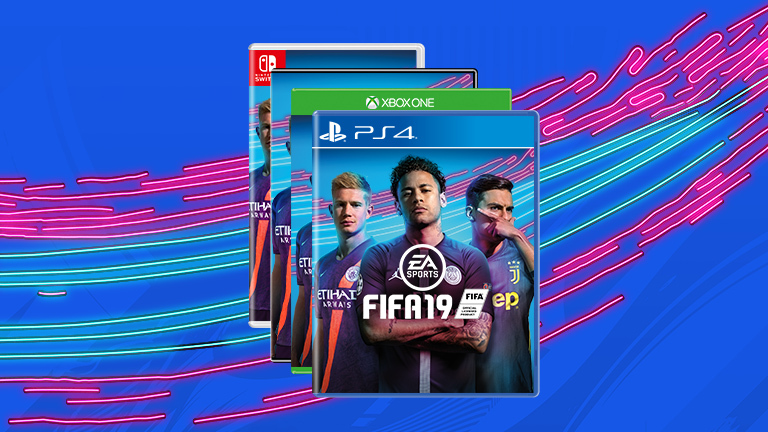 The FIFA 19 cover star’s career has been packed with awards and trophies, but after his high-profile move to Juventus this season, it’s clear that Ronaldo isn’t done racking up silverware. The Portuguese forward continues to play like the world’s best, and his ratings are evidence of an astoundingly talented player. 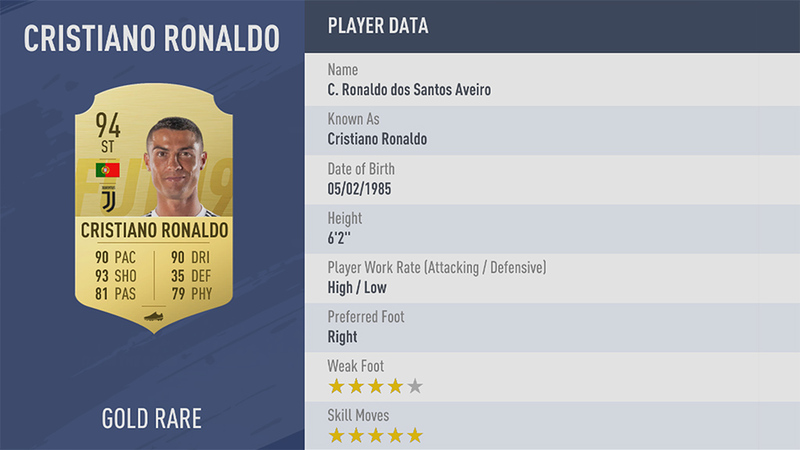 Ronaldo beats defenders left and right when attacking, burning them with his 90 Pace and bamboozling them with a 90 Dribbling rating. But the most complete forward in football stands above the rest with a 93 Shooting rating, evidence of a natural finisher who puts away more chances than he misses on a regular basis. Aguero has come up big for Manchester City over the years, scoring crucial goals at some of the club’s most important moments. But even with this history, the experienced Argentine striker remains at the top of his game, able to beat nearly any defender with the ball at his feet (89 Dribbling) and finish even the most impossible-looking chances (89 Shooting) that come his way. An old-school defender with a modern mindset, Chiellini has been a steadfast presence in Italian football for a long time. His modest 82 Physical rating allows him to go toe-to-toe with even the burliest of forwards, but it’s his 91 Defending rating that explains the ball-winning ability and controlled aggression that makes him close to peerless amongst the world’s defenders. Though he spent much of his career as a winger, the flying Frenchman reached new heights of respect and stardom after moving to center forward. Able to lead the line elegantly and effectively, Griezmann uses his 88 Dribbling and 86 Pace to slip behind the lines and send the defence reeling before unleashing another rocket towards goal, courtesy of his impressive 86 Shooting rating. Often described as an old-fashioned center forward, there is nothing outdated about Kane’s sheer ability to put the ball in the back of the net. No matter what sort of goal chances Kane gets, his 90 Shooting rating shows that he can do something with just about any of them, from diving headers to distant volleys. Despite his humble exterior, the compact Frenchman is the quiet essential midfield cog for every team he plays for. Kanté is a complete midfielder in every sense, just as proficient at tackling and marking (87 Defending) as he is at bossing opponents around (84 Physical) and bringing the ball forward to initiate attacks (81 Dribbling). The young Slovenian goalkeeper is already one of the best even at a young age, exemplified by his composure (92 Handling), athleticism (86 Diving), and razor-sharp reaction saves (89 Reflexes). A regular award-winner in LaLiga, it’s safe to say that he will only get better with increased experience at the highest level. Fresh off a move to Real Madrid, the Belgium international is ready to impress upon his return to LaLiga this season. Courtois is not only a defensive asset with his impressive 88 Reflexes and 87 Diving skills, but his ability to hold onto the ball and slip it to a teammate for a quick counterattack (91 Handling) is why he continues to play for renowned clubs. Highly experienced with both club and country, Godín isn’t flashy and ostentatious like some modern center backs—he sticks to the basics and does them extremely well. Thanks to a respectable 84 Physical rating, the Uruguayan deals well with forwards big and small with relative ease. Godín’s 89 Defending covers the many abilities that he has honed and perfected during his long career, from hard tackling to intelligent, quick evaluation of any game situation. Known for an occasionally aggressive, high-risk/high-reward style of goalkeeping, the German is tremendously versatile. He tops the ratings charts for crucial goalkeeper skills, like a 91 Diving and 88 Reflexes. He stands out among other notable shot-stoppers with his distribution; whether it’s playing as a “sweeper-keeper” due to a 91 Kicking rating or making a pinpoint throw to a teammate, Neuer’s presence is so strong that it’s almost like having an 11th outfield player. Topping the Bundesliga scoring charts season after season, Lewandowski has effectively cemented his place as a legend leading the line in Germany’s top league. Though he looks, on the surface, to be a very traditional center forward with his 89 Shooting and 82 Physical ratings, his 85 Dribbling displays a technical ability that equals being well-rounded as a striker, able to weave his way past defenders before smashing the ball into the back of the net. The Brazilian winger nicknamed “The Magician” during his time at Liverpool is thriving in his role at Barcelona, where his 91 Dribbling constantly mystifies and overwhelms defenders. He often drifts from his outside role, whether it’s to utilize his silky 86 Passing rating to set a teammate up or go directly to goal and shoot with confidence thanks to his 81 Shooting rating. The French goalkeeper has many assets that make him an elite player, but he’s probably best known for his lightning-quick 92 Reflexes that come in handy when facing penalty kicks, point-blank headers, and more. Lloris can also get anywhere between the posts in a flash to make an acrobatic save, thanks to an 88 Diving rating. Possibly the most skillful and technically-gifted fullback in the current game, Marcelo approaches his command of the left flank the only way a Brazilian can—with style. His 90 Dribbling rating is better than all but the top attackers, making him more than suited to getting forward and creating chances. But he’s no slouch as a defender, either, using 81 Defending and 82 Physical ratings to stifle opposing wingers with ease. The Egyptian winger had a sensational, record-breaking debut season with the Merseyside club, and it’s a safe bet that he’ll continue to impress in year two. As the song his fans sing for him goes, Salah is often seen “running down the wing” with his 92 Pace and 89 Dribbling ratings, leaving a trail of disappointed defenders along the way. He plays well with teammates, but Salah’s goal tally last season is proof that he is just as dangerous when going for goal utilizing his 84 Shooting rating. A breakout star for Real Madrid in recent seasons, the Spanish playmaker is able to move around midfield—but his comfort level rises when given the opportunity to use his 92 Dribbling ability. Isco reads and anticipates opponents well from his position, and is always looking for creative ways to get the ball to teammates with his 85 Passing. Germany shot-stopper Ter Stegen is a very complete goalkeeper who excels in nearly every required trait; he uses height to his advantage, where his 87 Diving rating comes in handy, and his 90 Reflexes let him cover dangerous point-blank chances. Ter Stegen stands out amongst his peers, however, thanks to his distribution. An 88 Kicking rating makes his goal kicks and powerful and accurate, while 85 Handling keeps him composed when initiating counterattacks after a save. Another midfield virtuoso, Silva’s career is decorated and impressive, and he’s not done yet. Often moved around in midfield to get the best out of his myriad talents, the Spaniard is a pure playmaker no matter where he ends up on the pitch. He pulls the strings and marshals his troops with intelligent, technical 91 Dribbling abilities and pinpoint 87 Passing that opponents are rarely able to contain. The strong, tall German center back is another world-class example of the ideal modern defender; technical and composed on the ball, he doesn’t sacrifice even a sliver of his defensive responsibilities. Hummels has a 90 Defending rating, which reflects his powerful tackling, aerial dominance, and ability to read the game from the back. If necessary, he can play the ball out of the back and start attacks, using 76 Passing and 73 Dribbling abilities—high marks among even the cream of the center back crop. The formidable Uruguayan forward is among the finest on his own, but he has formed powerful partnerships for both club and country that make him even better. Cavani’s 80 Dribbling lets him get into dangerous positions and shake defenders, while his 87 Shooting shows how brilliant he is when presented with an opportunity to score—because he rarely misses those chances. Absolutely exploding last season for Juventus, Dybala played his way into being a household name in world football. In fact, the Argentine is so well-rounded that it’s hard to pin him down in a single role. His 85 Pace is suited for running onto a teammate’s through ball, and his 85 Shooting ability is good enough that he’s occasionally deployed as a forward. Regardless of position, Dybala is a superlative playmaker able to create incredible chances and goals from nothing, using 91 Dribbling and 84 Passing ratings. The speedy Italian winger is yet another Napoli star whose stock has risen with his club’s in recent seasons, and for good reason. In addition to his excellent 90 Pace rating, Insigne is tricky and technical with the ball at his feet thanks to a 91 Dribbling rating, and always good for a pass or cross thanks to a solid 84 Passing rating. The Inter Milan shot-stopper has improved steadily over the years, as evidenced by his stellar ratings in most goalkeeping categories. Handanovič is composed with the ball at his feet or in his hands (86 Handling), able to get to even the craziest of shots (87 Diving, 89 Positioning), and capable of ridiculous reflex saves (89 Reflexes) when called upon. Few forwards can say they have excelled at so many of the world’s top tier clubs, but Higuaín is almost certainly one of them.  Now with AC Milan, the Argentine striker still has elite finishing ability, as shown by his 87 Shooting rating, and can hold the ball and show off technique with an 83 Dribbling. Long-term success at the top requires more than strikers and creative midfielders—it also needs a defensive backbone that reaches into midfield. Brazilian defensive maestro Casemiro has taken up that mantle at Real Madrid supremely well, and it’s likely that he’ll help them add more to the trophy case. His 87 Defending and 88 Physical ratings make him perfect for breaking up attacks, protecting the defense, and everything else required of the role. Colombian midfield magician Rodriguez impresses year after year, no matter where he happens to be playing. Now helping pull the strings for Bayern Munich, Rodriguez has an astounding 88 Passing rating that combines well with his 86 Dribbling rating to turn him into an assist-creating machine for the talented forwards around him. But he doesn’t stop there; his 86 Shooting rating is almost as impressive, and he often shows it off when he gets an opening and rips it towards goal. After nearly two decades with Juventus, Italian goalkeeping legend Buffon made headlines with his move to Paris Saint-Germain ahead of this season. Buffon barely shows signs of wear and tear, still able to compete (and stop) the best in the world. His 87 Handling and 90 Positioning ratings are an obvious result of his vast experience in the game, but it’s his 88 Diving rating that demonstrates how talented Buffon is. Tottenham Hotspur’s creative genius is the type of player that always surprises and delights; when you think he’s run out of ideas, he pings a pass in at an impossible angle or scores a free kick that few players would even attempt. Eriksen conducts from midfield with his 86 Dribbling and 89 Passing ratings, and occasionally steps into the spotlight himself thanks to an 82 Shooting rating. Yet another of France’s world champions from this summer, Pogba left Russia as one of the most impressive players from throughout the tournament. He dominates midfield for club and country using a combination of creativity (86 Passing, 85 Dribbling) and brute force (87 Physical) that is rarely seen in the modern midfielder. But he doesn’t have to choose between brute force and technical wizardry, because he has an ample amount of both to work with. Spanish defensive midfielder Busquets remains the epitome of the defensive midfielder, and holds a valued starting role protecting Barcelona’s back line. With a combination of 85 Defending and 80 Physical ratings, Busquets dutifully cleans up opposing attacks, distributes the ball to his teammates, and fiercely tackles the ball away from anyone who tries to get close to his goal. Welsh winger Bale continues to thrive on the right side for Real Madrid, occasionally playing a more central role depending on who else is on the pitch. His 95 Pace is up there with the fleetest-of-foot in world football, but it only works so well for Bale because it’s combined with 85 Dribbling, 88 Shooting, and 84 Passing ratings. Whether he cuts inside to shoot, opens up space with a defence-splitting pass, or takes one of his famous swerving free kicks, Bale regularly devastates opponents in a variety of ways. The Senegalese winger has exploded onto the scene in recent seasons, impressing for both club and country. His 94 Pace, 87 Dribbling, and 80 Shooting ratings were on display when he scored against Real Madrid in the 2018 UEFA Champions League final, just as they had been all season as Mané played a key role in Liverpool’s devastating attack. After years of building a solid resume at Inter Milan, Perišić became a household name with his sublime performances for Croatia at the 2018 World Cup. Despite lining up as a left midfielder, Perišić is often all over the pitch, utilizing his diverse skill set to create, assist, and score goals. His 86 Pace and 83 Dribbling ratings grab the headlines, but the combination of those with his 80 Shooting and Passing ratings is what truly elevates him to the top of the game. Despite his youth, the French defender has earned a starting role for the biggest club in Europe—and the reigning World Cup champions. His performances for Real Madrid and France come down to his incredible versatility as a center back—not only does Varane excel as a defender (86 Defending and 80 Physical ratings) in the traditional sense, he’s also quick on his feet (84 Pace), able to support midfield and attack then track back quickly to thwart counterattacks. After a sensational season in which he put on a scoring masterclass in Serie A last year, Immobile is set to have another brilliant year with Lazio. Even though he’s a well-rounded forward with respectable 82 Pace and Dribbling ratings, Immobile’s status as a pure world-class finisher is exemplified by his 87 Shooting rating. While he tends to drift all over the front line for both Manchester United and the Chile national team, Sanchez is in his element when lining up on the left and cutting inside (using his 89 Dribbling rating) to create havoc and open up space—or to take a shot for himself utilizing his respectable 83 Shooting rating. Another young center back whose stock has soared in the last year, Koulibaly is the kind of defender that even the best forwards see in their nightmares. An absolute rock at the back who can out-jump and out-muscle almost any opponent (86 Physical), Koulibaly held strong for Napoli in Serie A last season and Senegal in the 2018 World Cup thanks to his astounding 88 Defending rating. Equipped to play most attacking positions, Mertens has thrived since settling in a more central role, often deployed as a false-nine. The Belgian has an astounding 90 Dribbling rating and 89 Pace, which constantly help him get into dangerous positions in the box. Mertens also has 83 Shooting and 80 Passing ratings, giving him the confidence to shoot if he as a chance or lay the ball off to a teammate. Two-time Serie A top goalscorer Icardi is an instinctual finisher, a forward with a nose for goal and who is as efficient and accurate with both feet as he is with his head. The Argentina international’s 85 Shooting rating is by far his most notable number, but it sets him above nearly all of his peers—just check the record books. One of the leading goalkeepers in Europe last season, Navas rarely puts a foot (or hand) wrong between the sticks. The Costa Rican’s 90 Diving stops even the most accurate of shots out of the corners, while his 90 Reflexes make him excellent at stopping penalties and point-blank shots on goal. After thriving in Ligue 1 and the Bundesliga, Aubameyang took his talents to the English Premier League and Arsenal last season. In his short time in England, he’s already shown off the skills that made him such a valuable target for the London club, including his blistering 94 Pace and 84 Shooting. A true legend, Iniesta made headlines this summer for his move from the only professional club he’s ever known, FC Barcelona, to a new challenge with Japanese club Vissel Kobe. The midfielder’s trophy cabinet is bursting with honours, from a World Cup winner’s medal to four UEFA Champions League titles. Iniesta’s technique (90 Dribbling) and 87 Passing rating mean he’s among the world’s finest; few players can even come close to his talent with the ball at his feet. Perhaps the ideal fullback in a system like Barcelona’s, Alba has been dominating the left side of his club’s defense (and often, midfield and attack) for quite a few seasons now. The Spaniard’s 93 Pace and 83 Dribbling lets him shuttle up the flank with the ball, beat opponents, fire in a cross or pass to a teammate, then run back to defend without skipping a beat. The big Belgian center back is the cog that keeps Tottenham Hotspur’s defence running smoothly, as he uses all aspects of his 88 Defending rating to lead his teammates, mark attackers, tackle the ball away, and win aerial duels at every opportunity. A household name after he scored the winning goal for France in their 2018 World Cup semifinal against Belgium, Umtiti combines youthful exuberance with a defensive proficiency rarely seen in younger players. His 88 Defending covers his intelligent reading of the game, perfectly-timed tackling, and unfailing commitment to keeping the ball out of his team’s net. Umtiti is also no slouch in the strength department; his 82 Physical rating is obvious in the ease with which he knocks attackers out of the way, shields the ball when necessary, and flies through the air to win headers. Possibly the greatest Slovak to ever take the pitch, Hamsik has become a hero at Napoli after making nearly 400 appearances over more than a decade with the Italian club. His well-rounded skill set has helped him adapt to just about any situation, but the playmaker’s current role in the heart of Napoli’s midfield is powered by his 84 Dribbling and 84 Passing ratings. Hamsik’s strengths don’t end with his creative brilliance; he’s also a capable finisher (80 Shooting) in open play and from set pieces. At first glance, the Belgian is the prime example of a traditional striker: tall, strong (87 Physical), capable of brilliant finishing (82 Shooting). But Lukaku has earned himself a place in the game’s elite by combining his traditional forward’s qualities with an 84 Pace rating, meaning that he’s as likely to leave a defender in the dust as he is to muscle him off the ball. This is a rare combination in today’s game and explains the Belgian’s strong, consistent scoring numbers for both club and country. Rakitić had a brilliant World Cup for Croatia, building on his already excellent reputation at Barcelona over the past couple seasons. His 87 Passing and 82 Dribbling ratings keep him at the top of his midfield game, spraying passes around the pitch and beating opponents with technique and skill. When given the opportunity, he can really lash the ball towards goal with an 84 Shooting rating. Another living legend who has racked up countless awards with Barcelona and Spain, Piqué combines height and strength with world-class defending ability. Still in the prime of his career, Piqué excels in the air on both sides of the ball thanks to his 76 Physical rating, and his 87 Defending rating includes solid leadership ability, intelligent tackling, and calm composure in even the toughest matches. As if commanding a massive transfer fee as a teenager wasn’t enough, Mbappé showed off what Paris Saint-Germain saw in him last season and during the 2018 World Cup. The winger had a very good tournament overall, but he capped it off with a brilliant goal in the final against Croatia to become only the second teenager to score in a World Cup final—after Pelé. Mbappé never hesitates to show off his 96 Pace and 89 Dribbling ratings, bombarding the right wing every chance he gets. A fortress in the Paris Saint-Germain defence, the Brazilian captains the French club with consistency, intensity, and exceptional skill. Silva is one of the most complete central defenders in world football (88 Defending), able to create chances and move up the pitch without sacrificing his tackling, organization, and other defensive responsibilities. The Belgian midfielder is known for his intimidating presence in the middle of the pitch, which isn’t necessarily commonplace for a player whose chief role isn’t to defend or protect his back line. Nainggolan is truly two-way in that he’s nearly as good with the ball as he is at getting it back. His 83 Physical and Defending ratings give him the edge when trying to intercept or tackle, while a respectable 82 Dribbling rating provides the confidence and composure he needs to create something for his attackers. Steadily building his reputation around the world after making his presence known in Serie A, Brazilian left-back Sandro brings a balanced skill-set to a position that is probably more important than ever before. He’s a menace when running up the pitch, leaving opponents in the dust with his 85 Pace and 81 Dribbling ratings. But as with any top fullback, Sandro also possesses dangerous Defending (82) and Physical (83) ratings that make him more than capable of standing up against even the most talented of wingers. The Moroccan international has played for some of the world’s biggest clubs in recent seasons, settling in Turin with Juventus after a loan spell. Benatia has all the key attributes of a top defender, including 87 Defending and 85 Physical ratings. He has an important role in the Juventus defense, using his height to dominate in the air and his experience to organize the players around him. Though often deployed in a deeper midfield role, Parejo’s strengths tend to skew towards the offensive. Whether he’s creating something for a teammate with a clever pass (88 Passing) or bursting into the box to take a shot for himself (80 Shooting), Parejo has a particular set of skills that make him very dangerous in just about any situation. Generally deployed solely as a defensive midfielder, Serbian international Matić treats his role like a highly-specialized craftsman would. With 83 Defending and Physical ratings, Matić can do nearly anything needed in a defensive capacity—which he is often tasked with doing. One of the fastest left midfielders in the game, Costa’s 95 Pace is nothing short of electrifying. Combined with his 91 Dribbling rating (and 5-star skill moves), the Brazilian excels at getting into precarious positions on the left side where he can fire in crosses or cut inside to shoot. After making the transition from fullback to center back a couple seasons ago, the Spaniard has thrived by playing the position to his strengths. Azpilicueta has a whopping 87 Defending rating, which illustrates his excellence at the most important part of his position. While he’s not as tall as some of the giant center backs out there, his strengths (intelligence, quick feet) more than compensate as he has cemented a spot in one of the best defences in the English Premier League. The Brazilian colossus is tall, even by center back standards at 6’6”, meaning that challenging him for a ball in the air is often utterly futile. He’s not just a giant body in the box, though: his 87 Defending rating shows how well-rounded Naldo is as a defender. The Schalke man is also surprisingly good at set pieces, known for blasting the ball into the net with speed and accuracy not always associated with center backs. Another paragon of the modern defensive midfielder, Fernandinho has the ideal attributes for his position—with a few tricks up his sleeve for when he happens to make it further up the pitch. His respectable 83 Defending rating is the centerpiece of his game, as he is usually tasked with recovering the ball in midfield or defending his back line. But his 79 Dribbling and 78 Passing ratings are solid, which helps him keep composure when taking the ball forward to create attacks or open space for teammates. Perfectly suited to a deep-lying playmaker position, Pjanić has the chops to create just about anything from midfield. His 86 Dribbling ability keeps defenders off his back, while his 86 Passing rating lets him ping the ball all over the pitch to kick off attacks and play his teammates through on goal. Another speedy winger who makes the leap to world-class with exceptional technique on the ball, Sané flies down the left with his 95 Pace, but rarely loses the ball thanks to his 86 Dribbling ability. Depending on how his team is playing, he’s more than capable of cutting inside and lashing a shot at goal with an 81 Shooting rating. Italian hero Bonucci is known around the world for his performances for both club and country, and he’s still going strong. His 87 Defending rating encompasses tackling skill and ability to read the game, both of which play into his excellent form over the course of his career. Bonucci combines that with an 80 Physical rating that helps him win aerial battles and knock opponents off the ball like it’s second nature. As far as center backs go, the Bayern Munich and Germany stalwart is about as complete a player as the position gets. His 85 Defending rating covers a penchant for tough tackling and defensive intelligence, but his 83 Physical rating also helps him shrug off challenges and keep the opposition at a distance. A prime example of a versatile attacker in the modern game, Muller has played just about every offensive position. But his nose for the goal (83 Shooting) and natural composure (78 Dribbling) on the ball lead many to believe his best position is as a forward. He often gets deployed in a “second striker” role behind another forward, in part because a solid 80 Passing rating thelps him create for the main forward or another teammate. The Brazilian shot-stopper has emerged as one of the best young goalkeepers in the world after his big move to Manchester City ahead of the 2017-18 season. 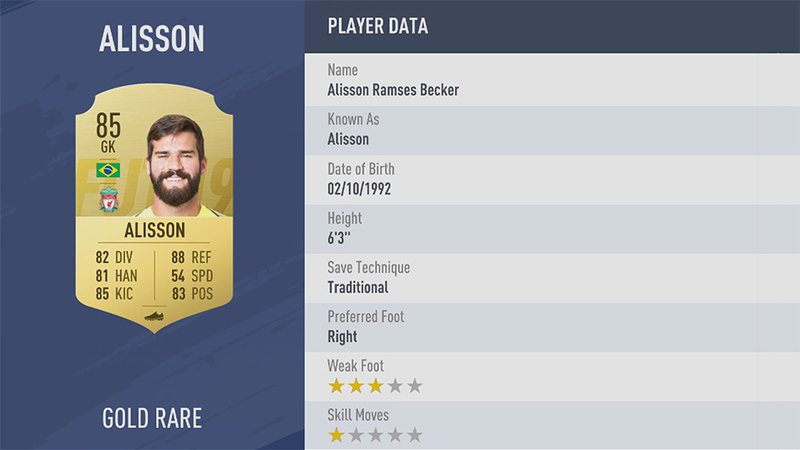 Ederson checks nearly all the important boxes for the position, including a 90 Kicking rating that allows him to get counterattacks going quickly and accurately, an 85 Diving rating that explains how he seems to be able to get a hand on the most impossible shot attempts, and a ridiculous 87 Reflexes rating – few can catch him off guard between the posts. A little different than many modern strikers, the Brazilian is well-rounded and versatile, just as able to flash his technique (86 Dribbling) as he is to make important passes (80 Passing) and shoot from just about anywhere (83 Shooting). Firmino does all the little things perfectly—and pretty much all the big things as well, making him a dream for almost any manager. Ridiculously talented with the ball at his feet (89 Dribbling), Italian midfield maestro Verratti creates space and kicks off attacks either on his own or with a slick, incisive pass (84 Passing) to split the defence wide open. Though he frequently starts deeper in a more central position, Verratti is usually found all over midfield, picking up the ball and making things happen when the opposition least expects it. Argentine center back Otamendi has built his stock up considerably over the past few seasons with Manchester City, thanks to many strong performances in the heart of the defence for the reigning Premier League champions. He has an 86 Defending rating and 80 Physical rating, yet another solid center back skill set, that makes him a proficient tackler, strong in the air, and easily able to hold his own when fighting an opponent. The Spanish midfield wizard thrives in a deeper position, allowing him to put his significant playmaking skills to good use as he conjures up ridiculous attacks for his team. Thiago can twist and weave his way through opponents, as evidenced by his 89 Dribbling rating, but it’s his distribution of the ball and passing vision (84 Passing) for which he is most often praised. The German midfielder is considered a strong playmaker, but Ozil is more often deployed close to the strikers rather than the defenders. Whether it’s helping set up a one-two into the box, releasing a forward on goal with a through ball, or leaping on a loose ball and running it into the box himself, Ozil uses his 86 Passing and 84 Dribbling ratings to great effect from his preferred position. One of the quickest central defenders in the game (83 Pace), the big Greek is a cornerstone in the heart of Roma’s defence. Whether he’s tasked to mark a tricky forward or play deeper and clean up after his teammates, Manolas is a dependable and well-respected player in the prime of his career. The Algerian international exploded onto the global football stage after playing a key role in Leicester City’s miraculous run to the English Premier League title in 2016. The winger has only improved since then, making a bold move to join the reigning champions ahead of this season. His 85 Pace and 90 Dribbling ratings mean he’s extremely dangerous and unpredictable on the right side of any attack. There’s little that can be said about the enigmatic Swede that he hasn’t said about himself, but even in the later stages of his career, many would agree that Ibrahimovic is one of the game’s dangerous pure strikers. While the LA Galaxy man is a solid passer and dribbler, his finishing is still as world-class as ever, as evidenced by his 86 Shooting rating. English winger Sterling is often rightly praised for his blistering speed (93 Pace), but his 87 Dribbling ability means that his technique and ball control are almost as impressive. Sterling played a big part in Manchester City’s title run last season, and he improved quite a bit in the process—as evidenced by his stellar ratings. Fierce central midfielder Matuidi not only impressed with Juventus last season, he also played a crucial role for France in their incredible 2018 FIFA World Cup run. Matuidi excels in a deeper holding role, able to clean up in front of his defence and win the ball back (83 Defending) with his tireless engine and intimidating physique (83 Physical rating). Even though tricky Spanish winger Asensio doesn’t top the charts in any one category, he’s above average in several areas. His 81 Pace gives him respectable speed for running down the wing, while his 83 Passing also lets him create chances from outside areas. Asensio’s Shooting rating of 84 makes him extremely goal-dangerous when cutting inside, an ability that he also excels at thanks to his 85 Dribbling. Even though Serbia didn’t make it out of the group stage of the 2018 FIFA World Cup, Milinkovic-Savic turned heads around the world with his impressive performances in midfield for his country. Not that this was news to Lazio fans, who have seen his quality for a few seasons now. The Serb midfielder can play just about anywhere in midfield, utilizing his 80 Passing, 82 Dribbling, and 84 Physical ratings to great effect in both attack and defence. The young German right-back has burst onto the scene for both club and country in recent seasons, and for good reason. With 82 Dribbling and 83 Passing ratings, Kimmich has the composure and technique to be the paragon of the modern attacking full-back, and a 77 Defending rating that keeps his backline safe as well. The traditional striker reigns supreme in the Italian capital, taking advantage of his size and pure finishing ability to dominate the scoring charts in Serie A. The all-time leading goalscorer for Bosnia and Herzegovina, Džeko uses his impressive 85 Shooting rating to do one thing: score goals. A complete midfielder in the mold of his countryman Xavi, the Spaniard pulls the strings from the middle of the pitch for both club and country. His stellar 88 Passing rating gives him the tools to create just about anything: from through balls to one-two passes to crosses. Space is never at a premium on the pitch for Koke either, as he twists and turns his way through the opposition using his 82 Dribbling rating. The German international has one of the most comprehensive skill sets in Europe; he’s dangerous anywhere in the attack—though he absolutely thrives on the left flank. While very quick (85 Pace), his technique on the ball is even better (86 Dribbling), ensuring that he doesn’t lose the ball in the middle of one of his flying runs up the flank. The ideal left-back needs a balanced combination of defense and attack, tilting towards one or the other when his team needs it. Experienced Brazilian fullback Luis has that perfect mix, highlighted by an 81 Defending rating and 79 Dribbling rating, easily allowing him to switch gears at the drop of a hat. Consistently rated as one of the top wingers in the world for quite a while now, the Dutchman continues to have some of the best technique and movement out there. His signature style, cutting inside from the right wing to shoot with his left foot, is now commonplace—but he remains the master. His 88 Dribbling ability is as jaw-dropping as ever, and his finishing (85 Shooting) forces goalkeepers all over Europe to pick the ball out of the net on a regular basis. The Brazilian shot-stopper was brought to the Merseyside club this summer to improve their defence with the goal of taking a repeat trip to the Champions League final. He excels in many of the top goalkeeping traits, but his 88 Reflexes and 85 Kicking are the highlights that made him so highly-valued this summer. Another complete and balanced left-back, the Austrian international can defend with the best (81 Defending), but he’s also a valuable weapon in his team’s attacking arsenal. He often flies up the wing, shrugging off his counterparts with his 82-rated Pace, and helps create for teammates with his 80 Passing and Dribbling ratings. Another valuable defensive addition by Liverpool this past summer, Brazilian midfielder Fabinho’s ratings show exactly why the Premier League giants wanted him. His equally strong Defending and Physical ratings (both 84) make him the perfect candidate for sweeping away attacks in front of the backline and bullying opponents off the ball without even breaking a sweat. Having already played for some of the biggest clubs in the world, Chilean midfielder Vidal joined yet another top club when he moved to FC Barcelona last summer. While chiefly a defensive midfielder (thanks to his 84 Defending and 83 Physical ratings), Vidal is also extremely dangerous going forward. Just when the opposition least expects it, he rips a shot into the top corner (80 Shooting) and creates attacks from midfield (79 Passing) seconds after recovering the ball. In only half a season with Liverpool, the large Dutch defender showed how important his skill set is to a team desperate to keep the ball out of their net. An absolute giant at 6’4”, Van Dijk uses his 84 Physical rating to boss opponents around, collapsing any sense of personal space they had when they entered his domain. Combined with an excellent 85 Defending rating, Van Dijk is the archetypal modern center back—and he’s in the prime of his career. Making a move back to Atlético de Madrid last January after a spell with Chelsea, the imposing Spanish striker has continued to show why defenses all over Europe tremble at his name. His 83 Shooting shows that he rarely misses when presented with a choice opportunity, but it’s his 87 Physical rating that makes him unique among those in his position.